Once in a while a whale will end up swimming into shallow shores. They then run the extreme danger of ending up becoming stuck as the tide recedes. A baby pilot whale suffered exactly this earlier in the year. It got stuck on a beach in Costa Rica, near a river and it’s fate was not looking good. 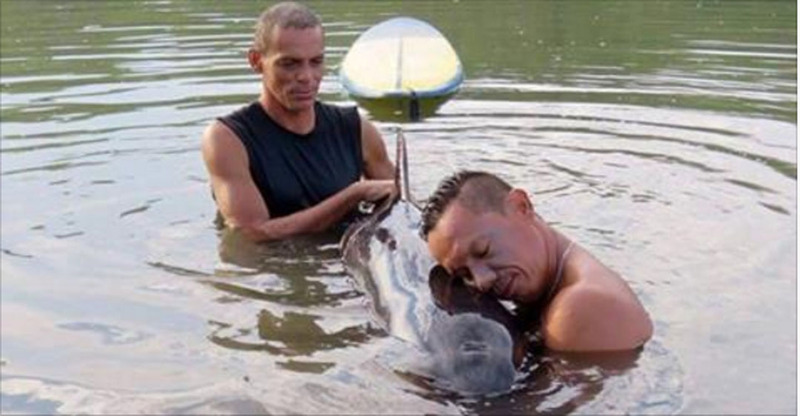 If it wasn’t for a surfer named Mauricio Camareno and a couple of his buddies, the baby whale clearly would have died. It was just a small bump they noticed coming from the water. The got a little closer and realized indeed it was a baby whale who was crying for help. Getting an actual whale of any size out of shallow water is no easy feat. They used all of their strength possible to move the very weak whale out to deeper water, while ensuring her head was kept up so she could breath. It took six hours! Then, finally, the whale was rested enough and began to get stronger. When the tide rose back up, the surfers had a window of opportunity to move the whale back out. She was now rested up enough and would have the strength to maneuver herself better. The three surfers spent several hours to get this whale back out to sea, and without their help the whale would have been stuck, and would have ended up dying. Instead the whale was brought out and now had the strength to swim further to the safety of deep water. No doubt this whale was very thankful that the men took so much time, and had so much patience, to save her life. Share this wonderful story with all of your animal loving friends and family!